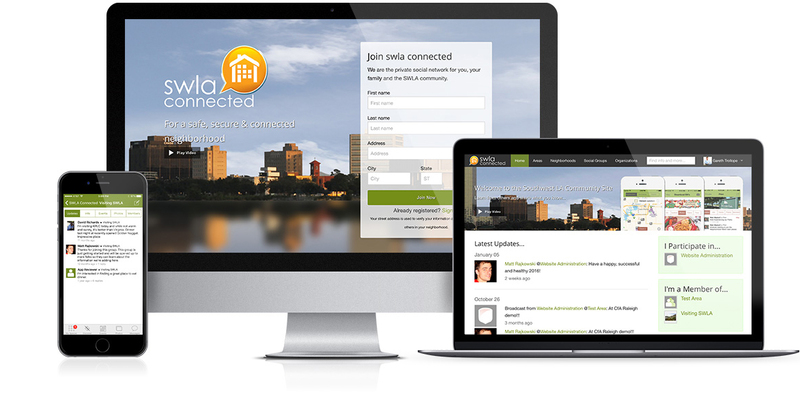 A private social network for citizens in the SWLA community to connect online in a neighborly way. Making neighborhoods safer through our technology. The site uses a social networking platform to bring information and social networking features to the community. Features include verified sign-up, joining groups, subscribing to information, and making friends. Once you sign in you can check your activity stream to see what is happening across the site and contribute your thoughts and experiences. Prototype: Covered roughly two months; two weeks for structuring the new Connect site, one month for development of new features, and two weeks for socializing it to stakeholders, gaining feedback, and then reaching consensus to go to the next phase. Soft Launch: As the beta continued and confidence grew, the site morphed into the initial "for real" system as existing content was added and employees and volunteers were trained on how to manage the content for which they were responsible. Production: Full production with the full suite of capabilities employed: Web, mobile, management console and a number of cloud services plugged in.